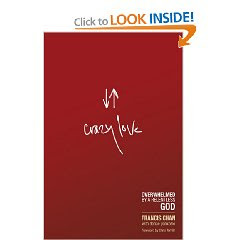 Our Young Adult Bible Study group at church is starting a new series reading and discussing Crazy Love by Francis Chan. I've heard that the book is #1 bestseller in Religion right now and ironically, out of all the books we could have read, this was the only one I have not read. I'm very familiar with Francis Chan because he was sort of like a fake campus pastor at APU where I went to college, speaking in chapel more than twice a year. Chan always manages to surprise folks with a fresh perspective on familiar ideas. I don't expect Crazy Love to be any different. If you've read it I'd be interested in what your impressions were. Dude, that stuff is crazy good.